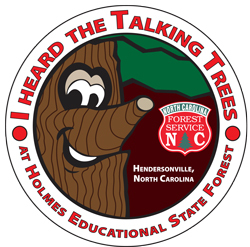 Holmes Educational State Forest has been providing the citizens of North Carolina a living outdoor classroom where visitors of all ages can learn about the local natural forest environment since 1977. The forest, which started out as a nursery developed by the Civilian Conservation Corps, has now become one of seven educational state forests located throughout the state. The land along Crab Creek Road was obtained by the state in the mid-1930’s to provide North Carolina landowners White pine and Yellow poplar seedlings. By the late 1960’s the state moved the nursery to Avery County and developed Holmes has a small state forest. Since then, the forest has grown into a diverse woodscape that includes many other plant species from herbs on the forest floor to towering forest trees.